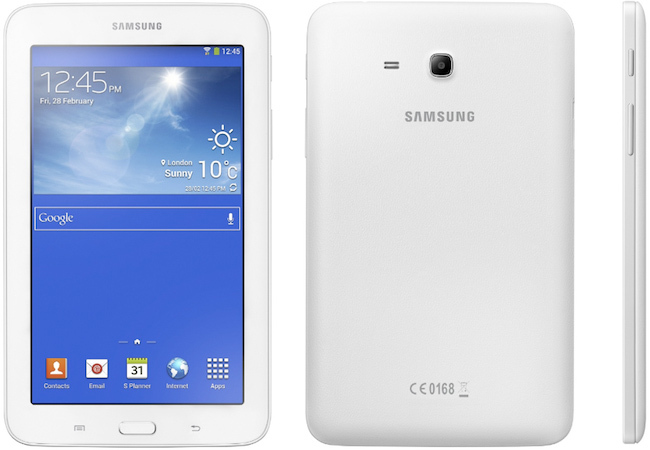 Samsung has further expanded its Galaxy Tab 3 line with the launch of a new 7 inch tablet called Galaxy Tab 3 Lite. Like its predecessors, the device runs on the Android operating system, and should be targeted at the mid-price range segment of the Indian tablet market. Here is a look at the specifications of the device. The tablet has a 7 inch WSVGA touchscreen display (1024x600 pixels resolution) and runs on the Android 4.2 Jelly Bean operating system (with Samsung TouchWiz user interface). It is powered by a 1.2 GHz dual-core processor and has 1GB of RAM. The internal memory of the device is 8GB that can be further expanded an additional 32GB with a microSD card. Galaxy Tab 3 Lite has a 2 mega pixel rear camera that can also record videos but no front facing camera, which means video calling will be a pain. The camera also features Smile Shot- enables it to automatically shoot when a smile is detected; Shoot & Share- enables users to share images right after they are captured; and Panorama Shot- lets users capture complete images of landscapes. On the connectivity front, it has Wi-Fi (with Wi-Fi Direct), Bluetooth 4.0, 3G and a microSD card slot. The dimensions of the device are 116.4mm x 193.4mm x 9.7mm and its weight is 310 gm (for the Wi-Fi version). The tablet is has a 3,600 mAh battery that the company claims will provide up to eight hours of video playback, GPS (with A-GPS support), and is capable of full high definition (HD) video playback. It will be available in white and black colours. Galaxy Tab3 Lite sports a slim, light-weight design and the menu bar is situated on the device's bezel, rather than on the screen, in order to maximise the wide screen experience. Additional apps included in tablet include Dropbox, Polaris Office, Flipboard, as well as Samsung's instant messaging app ChatON, among others. It also comes with Samsung Link, which allows users to share and play content across the company's other smart devices. While an exact price and India launch date has not been revealed by the company, looking at the specifications, we feel that it should lie in the Rs 12,000 - 18,000 range. In that range, it will compete with the likes of XOLO Play Tab 7.0 (Rs 11,999), Lenovo Idea Tab A3000 (Rs 13,849), Micromax Canvas Tab P650 (Rs 13,846), ASUS Fonepad 7 (Rs 16,999), and the Acer Iconia A1-811 (Rs 16,999), among others.